When a report runs Evergreen sends an email with a link to the output to the address defined in the report. Output is also stored in the specified Output folder and will remain there until manually deleted. 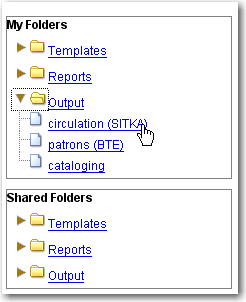 Click on Output to expand the folder. 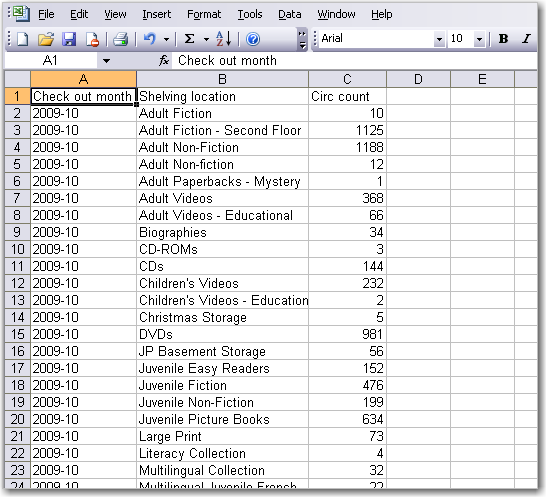 Select Circulation (where you just saved the circulation report output). View report output is the default selection in the dropdown menu. Select Recurring Monthly Circ by Location by clicking the checkbox and click Submit. A new tab will open for the report output. Select either Tabular Output or Excel Output. If Bar Charts was selected during report definition the chart will also appear.